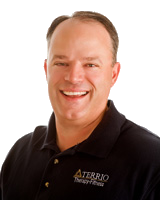 Tim Terrio is the Founder and President of TERRIO Physical Therapy-Fitness, Inc. Since its inception in 1998 TERRIO Therapy has grown from one location with one employee to fourteen locations and over 200 employees with plans for continued growth and diversification. As a Physical Therapist, Certified Athletic Trainer and Certified Strength Coach for over 20 years Terrio has personally assisted thousands of clients to recover function after injury or surgery and has earned a reputation for solving complex problems with innovative solutions. An advocate of lifelong learning Terrio has earned four college degrees including, A Doctorate in Physical Therapy and Master's Degree in Physical Education with an Athletic Training emphasis. As the company grew, Terrio shifted from treating clients a majority of the time to developing programs to help a greater number of people. Working with passionate professionals TERRIO Therapy diversified from orthopedic and sports physical therapy into Occupational Therapy and Speech Therapy to allow comprehensive programs in pediatrics, acute care, aquatic therapy and rehabilitation. Utilizing his education and experience in Athletic Training and Physical Education Terrio further diversified TERRIO Therapy into sports training. Over the years the TERRIO EDGE, the sports training division, has helped thousands of athletes, from youth to professionals, maximize their potential and reach their goals. Check out the Fitness Menu of Services for information and pricing. With a personal philosophy of treating the entire person Terrio has continued to develop programs which promote increased health and wellness. With the continuing increase in obesity rates and the corresponding chronic diseases Terrio has focused on creating programs that can lead to sustainable weight loss and improved health. Over the last four years several hundred people have lost thousands of pounds of weight and improved their blood glucose levels, cholesterol, blood pressure and fitness levels through the TERRIO LiveWell Challenge. Check out Tim Terrio's blog for health, fitness, and wellness tips and insights! © Copyright 2019 TERRIO Physical Therapy & Fitness, Inc. All Rights Reserved.